For anybody that does not know, Sunbelt Imports, aside from supporting all our great coffee shop customers, also offers a comprehensive catalog of gelato and gelato related products. From top of the line Bravo equipment, to PreGel ingredients to help support your gelato business. FYI – Gelato, which in Italian means frozen, is a type of ice-cream but unlike traditional American ice-cream, there is less air in gelato, and therefore the flavor is more intense. Gelato is also a healthier product, as it is made daily with fresh and all-natural ingredients, and contains 70% fewer fats (and subsequently fewer calories) than American ice cream. Sunbelt Imports are also an official distributor for Bravo equipment. Bravo is a leading manufacturer of a wide range of professional machines for the production of artisan gelato, pastry and chocolate. With the release of the sixth generation of Trittico®, Bravo has improved and evolved the concept of the multi-purpose machine. Further innovating it since it's initial launch back in 1974. Back in 1967, more than 50 years ago an innovative product was created. The struggle to get a product that would not melt easily and that would have consistent flavor, was behind the launch of Orange Fortefrutto® (fruit-based paste for flavoring artisanal frozen desserts). The man behind this innovative product was Dr. Luciano Rabboni who along side his wife Elena, helped sell this newly conceived product out of the trunk of their car. PreGel has kept this same dedicated driving force that has resulted in the extensive gelato related ingredients that form the PreGel catalog of products. 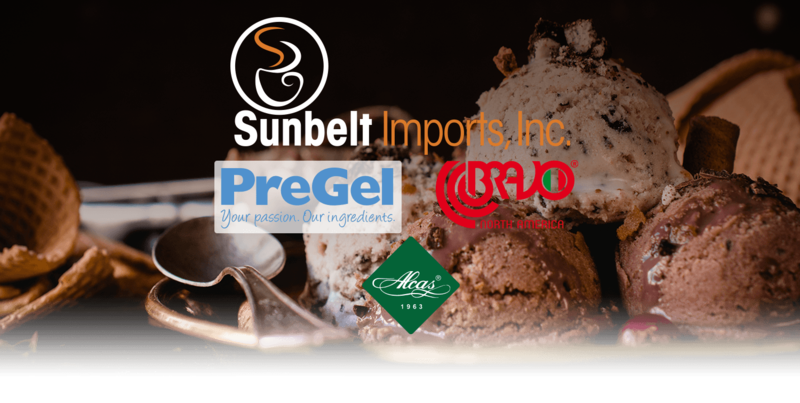 Sunbelt has the experience, equipment and product availability to help support your gelato business. 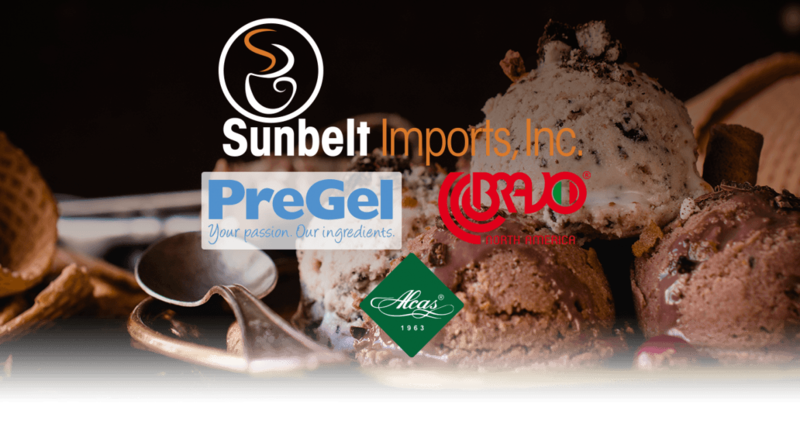 Aside of the required Bravo equipment and top quality PreGel ingredients, Sunbelt Imports also carry an extensive line of Alcas products imported from Italy. Alcas offers an extensive array of cups, spoons, trays, and many more items that can help your gelato business stand out above from the competition. If it tastes great, why shouldn't it look great also! If you have any questions please contact us and we will be glad to answer any of your questions.